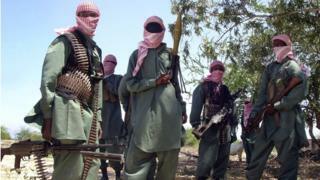 An American member of Somali Islamist militant group al-Shabab has been arrested in Somalia, an official has told the BBC. He said the man had been stopped while he was trying to escape from al-Shabab after some of his friends were killed following an internal rift. The cause of the dispute is not clear. The group has experienced some splits in recent months over whether to switch allegiance from al-Qaeda to the so-called Islamic State. The man's position within al-Shabab is not clear but Barawe District Commissioner Hussein Barre Mohamed told the BBC Somali service that the US militant has been in the militant group for "a very long time". The captured militant admitted that he had been involved in the al-Shabab attack on Garissa University college in north-eastern Kenya, in which 148 people were killed earlier this year, according to the commissioner. He added that the man does not speak Somali. He was intercepted by the Somali army on his way to Barawe, 220km (135 miles) south-west of the capital Mogadishu on Sunday, the commissioner told the BBC. He is being investigated by the police who are working with the army and Amisom, the Africa Union force in Somalia. Hundreds of foreigners are believed to have gone to join al-Shabab, including American Omar Hammami, known as al-Amriki, who was killed in 2013 Somalia after falling out with the group.